Made this today. YUM! It doesn't look the same as Joey's, but boy was it good! Thank you, Joey. 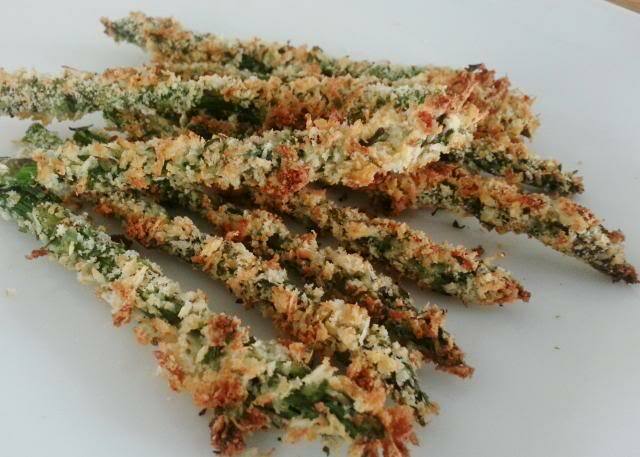 I really love asparagus and will give this a go. I like asparagus just as it is, too, but also in different recipes. I do think it should be appreciated so I think it's more of a shame just to use it as a veg in meat and 2 veg, as a sort of after-thought). You did a fine job Cheryl. It's a shame too many people only like them steamed, they don't know what they are missing! I would rather eat them, then french fries. PS: They look better then mine. You start with uncooked asparagus correct? I ONLY microwave steam my asparagus. I clean and rinse them, then place them in a container, nothing added to them at all, cover and steam just till tender crisp. I steam just about all my veggies this way including corn on the cob. Veggies have enough moisture none is needed. There are several exceptions - I DO added water to steam artichokes and I boil taters for mashed. I blanch them for 1 minute, then into an ice bath. Place them in food saver bags and freeze. Pull them out when needed.